Who will care for the caregiver? Using human-centered design concepts, patients, their family members, frontline workers and KP leaders are finding ways to ensure patients are safe at home and caregivers get the support they need. Beep! Beep! Beep! The electronic sound of Cary Brown’s alarm clock wakes him at 5 a.m. The Kaiser Permanente member rises to shower and make breakfast, careful not to disturb his sleeping wife, Elissa, who is recovering at home after surgery on a broken leg at the Woodland Hills Medical Center in Southern California. On top of completing household chores, the retired Hollywood TV director spends his day making sure Elissa is comfortable and pain-free. The experience has taken a toll on him. “The hours of staying awake and the repetitive nature of it—and not having any life at all outside of home—is very difficult,” says Brown, who worked on the hit TV series Doogie Howser, M.D. Now he’s part of an ambitious effort by the Southern California region to enhance support for caregivers, who play a vital role helping to heal and comfort patients outside the hospital. By reducing caregivers’ social isolation, integrating them into the hospital care team and addressing their health needs, regional leaders hope to improve patient safety and quality in the home. Under the initiative, frontline workers, physicians and managers are partnering with KP members and their families to design the ideal in-home care experience for patients and caregivers. Participants are using a creative approach to problem solving known as human-centered design, which starts with the people you’re designing for and ends with solutions that are customized to their needs. Human-centered design is also an ideal tool for unit-based teams to use on performance improvement projects. It delivers on the fundamental concept of the Value Compass—to put the member and patient at the center of decision making—and both frontline workers and Labor Management Partnership leaders, from management and the Coalition of Kaiser Permanente Unions, have been supporting the caregiver project. 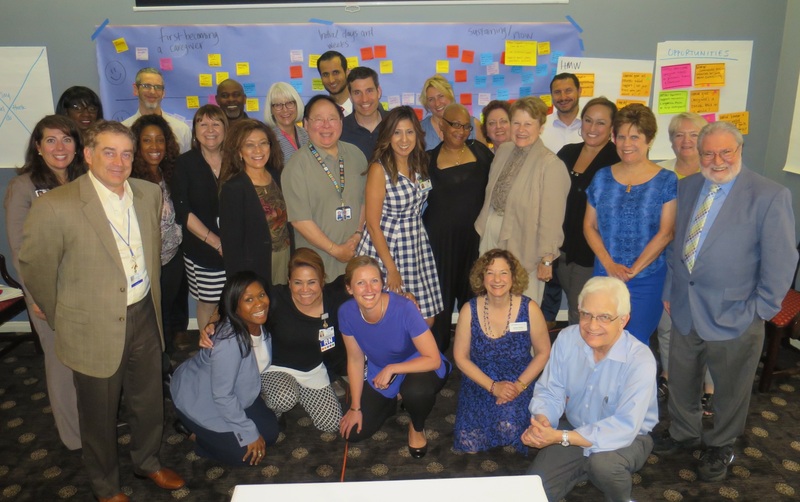 At a meeting in Pasadena, the participants—patients and caregivers, KP employees and physicians—gathered in small groups to share personal tales and draw storyboards to help identify barriers, come up with potential solutions and provide insights to regional Home Health leaders. Shawna Wallace, a senior physical therapist for Home Health and member of UNAC/UHCP, said the experience was eye-opening. Brown is hopeful that the approach will give caregivers—and their loved ones—the emotional and physical support they need to thrive. From the Desk of Henrietta: Mind, Body, Service Give patients a voice. When the Game Changes, Change Your Game An adult med UBT finds new ways to treat patients. A Mirror for Members Linking diversity and quality.